The phrase "slam dunk" has entered popular usage in American English outside of its basketball meaning, to refer to a "sure thing": an action with a guaranteed outcome, or a similarly impressive achievement. This is related to the high probability of success for a slam dunk versus other types of shots. Additionally, to "be dunked on" is sometimes popularly used to indicate that a person has been easily embarrassed by another, in reference to the embarrassment associated with unsuccessfully trying to prevent an opponent from making a dunk. This ascension to popular usage is reminiscent of, for example, the way that the baseball-inspired phrases "step up to the plate" and "he hit it out of the park," or American football-inspired phrases such as "victory formation" or "hail Mary" have entered popular North American vernacular. Joe Fortenberry, playing for the McPherson Globe Refiners, dunked the ball in 1936 in Madison Square Garden. The feat was immortalized by Arthur Daley, Pulitzer Prize winning sports writer for The New York Times in an article in March 1936. He wrote Joe Fortenberry and his teammate, Willard Schmidt, instead of shooting up for a layup; leaped up and "pitch[ed] the ball downward into the hoop, much like a cafeteria customer dunking a roll in coffee". "...in the old days, [defenders] would run under you when you were in the air... ...trying to take people out of games so they couldn't play. It was an unwritten rule..."
In one common variation, a 360° spin may be completed prior to or simultaneously with the tomahawk. Circa 2009, independent slam dunker Troy McCray pioneered an especially complex variant of the dunk: once the tomahawk motion is complete, instead of slamming the ball in the rim, a windmill dunk (see below) is then performed. Occasionally in the game setting, the windmill is performed via alley-oop but is rarely seen in offense-rebound putback dunks due to the airtime required. Dominique Wilkins popularized powerful windmills—in games as well as in contests—including two-handed, self-pass, 360°, rim-hang, and combined variants thereof. Modifiers are inherent to in-game dunking and conduce toward successful dunking as a means to score points. Modifiers are important in the grading of slam dunk contests because dunk types are made more difficult when modified (i.e., successfully executed modified-dunks ostensibly yield high scores in contests). Kendrick Nunn catches an inbounds pass from Jabari Parker (far left) with one hand and performs an alley oop dunk, catching the defender offguard. Kendall Pollard performs a baseline dunk before the defender can get in position. 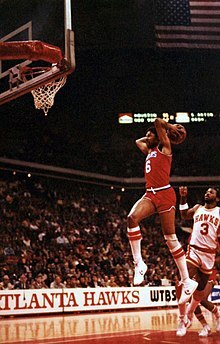 In the 1976 ABA Slam Dunk Contest, Julius Erving dunked after leaping from the free-throw line, with his heel on the line, and has since been credited with introducing the free-throw line dunk to the general public. In the 1988 NBA Slam Dunk Contest, Michael Jordan dunked from the free-throw line, in the same manner as Julius Erving, but parted his legs making his dunk more revolutionary than Erving's. In the 1990 NBA Slam Dunk Contest, Scottie Pippen dunked from the free throw line. This was in the first round and Pippen received a score of 47 out of 50 for his dunk. Pippen however didn't proceed to the next round and the contest was won by Dominique Wilkins. In the 1996 NBA Slam Dunk Contest, winner Brent Barry dunked from the free-throw line. Barry received 49 (out of 50) for the dunk. In the 2011 NBA Sprite Slam Dunk Contest, Serge Ibaka dunked from behind the free-throw line, getting a score of 45 for the dunk, and finishing 4th. In the 2016 NBL Pre-Season Challenge Slam Dunk Contest in Australia's National Basketball League, Adelaide 36ers 18 year old American import player Terrance Ferguson dunked from just in front of the free-throw-line. In the 2016 NBA Slam Dunk Contest, Zach LaVine dunked from the free throw line on three occasions: One Hand, Windmill, and Between the Legs. All of the Dunks received a score of 50 for the dunk and won the Dunk contest. Other instances of dunks from a distance abound. James White in the 2006 NCAA Slam Dunk Contest successfully performed tomahawk and windmill variations of the foul-line dunk. Though he was unable to complete a between-the-legs from the foul line at that contest, he has been known to execute it on other occasions. In the 2008 NBA Slam Dunk Contest, Jamario Moon leaped from the foul-line then, using his non-dominant hand, caught and dunked a bounce-pass from teammate Jason Kapono. Wilt Chamberlain was known to have dunked on an experimental 12-foot basket set up by Phog Allen at the University of Kansas in the 1950s. Michael Wilson, a former Harlem Globetrotter and University of Memphis basketball player, matched this feat on April 1, 2000 albeit with an alley-oop. Vince Carter dunked while leaping over 7-foot-2 (2.18 m) French center Frédéric Weis in the 2000 Summer Olympics. The French media dubbed it "le dunk de la mort" — "the dunk of death." At least one player has performed a 720 degree dunk (that is, two full turns in the air): Taurian Fontenette also known as Air Up There during a Streetball game. Several notable and remarkable dunks have been performed by participants in the annual NBA Slam Dunk Contest. Spud Webb at 5 ft 7 in (1.70 m) defeated 6 ft 8 in (2.03 m) Dominique Wilkins in the 1986 contest. Michael Jordan popularized a dunk referred to by some fans as the "Leaner". This dunk was so called because Jordan's body was not perpendicular to the ground while performing the dunk. TNT viewers rated it "the best dunk of all time" over Vince Carter's between-the-legs slam. JaVale McGee currently holds the world record for Most Basketball Dunks in a Single Jump: three. While competing in the 2011 NBA Sprite Slam Dunk Contest, McGee jumped with two balls in his possession and dunked each prior to receiving and slamming an alley-oop pass from then teammate John Wall. The game was delayed for nearly half an hour when Philadelphia's burly Luke Jackson shattered the glass backboard when he came down on the basket, ripping it from its moorings, on a driving stuff shot. Sylvia Fowles is one of five players to dunk during a WNBA game. Dunking is much less common in women's basketball than in men's play. Dunking is slightly more common during practice sessions, but many coaches advise against it in competitive play because of the risks of injury or failing to score. In 1978, Cardte Hicks became the first woman to dunk in a professional game during a men's professional game in Holland. In 1984, Georgeann Wells, a 6'7" (201 cm) junior playing for West Virginia University, became the first woman to score a slam dunk in women's collegiate play, in a game against the University of Charleston on December 21. As of 2014, 11 dunks have been scored in WNBA play. 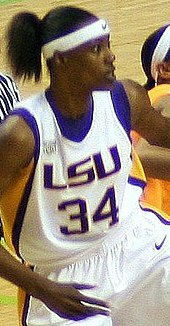 The first and second were scored by Lisa Leslie of the Los Angeles Sparks, on July 30, 2002 (against the Miami Sol), and July 9, 2005. Other WNBA dunks have been scored by Michelle Snow, Candace Parker (twice), and Sylvia Fowles. At the 2012 London Olympics, Liz Cambage of the Australian Opals became the first woman to dunk in the Olympics, scoring against Russia. ^ sportsillustrated.com, Lakers announcer Hearn dead at 85. Retrieved 15 April 2007. ^ "The dunk is coming back". Eugene Register-Guard. (Oregon). Associated Press. April 1, 1976. p. 1C. ^ Doney, Ken (April 1, 1976). "'They'll love dunk' - Miller". Lewiston Morning Tribune. (Idaho). Associated Press. p. 2B. ^ "Slam dunk: most welcome it". Lewiston Morning Tribune. (Idaho). Associated Press. April 2, 1976. p. 2B. ^ time.com, Lew's Still Loose. Retrieved 15 April 2007. ^ Caponi, Gena (1999). Signifyin(G), Sanctifyin', & Slam Dunking. Amherst: University of Massachusetts Press. p. 4. ISBN 978-1-55849-183-0. ^ "Houston cage coach advocates stuff shot". Eugene Register-Guard. (Oregon). Associated Press. March 24, 1967. p. 3B. ^ Demirel, Evin (2014-02-15). "The First Dunk in Basketball". The Daily Beast. Retrieved 2019-02-22. ^ NBA Jam Session: A Photo Salute to the NBA Dunk. History. Page 22. 1993, NBA Publishing. ^ "YouTube: T-Dub Dunks". Retrieved 22 May 2012. Fast-forward to 00:09 in the video. ^ 101Retro - Troy McCray. Retrieved 21 May 2012. ^ "JUMPUSA.com: Stickum Grip Powder". Archived from the original on 6 June 2012. Retrieved 21 May 2012. ^ "Isiah Rider's Between-the-Legs Dunk". Retrieved 8 July 2012. ^ "Orlando Woolride :: 1984 between-the-legs dunk". Retrieved 8 July 2012. ^ "Rick Davis between the legs". Retrieved 8 July 2012. ^ "Ricky Davis failed dunk". Retrieved 8 July 2012. ^ "Josh Smith misses between the legs dunk". Retrieved 8 July 2012. ^ For both one- and two-footed jumper there are four possible between-the-legs and finishing-hand combinations. ^ "Flying 101 :: Dunk Encyclopedia -- Taamallah". Retrieved 8 July 2012. ^ "Jason Richardson Lob reverse BTL". Retrieved 8 July 2012. ^ "Jason Richardson". Retrieved 8 July 2012. ^ "Flying 101 :: Dunk Encyclopedia :: Cradle BTL". Retrieved 8 July 2012. ^ "Kobe Bryant Elbow hang dunk". Retrieved 11 July 2012. ^ "Armpit hanging on the rim dunk". Retrieved 12 July 2012. ^ "Haneef Munir Windmill Elbow hang". Retrieved 11 July 2012. ^ "Kenny Dobbs Slam Interview (half way down page)". Archived from the original on 9 October 2011. Retrieved 11 July 2012. ^ "2008 City Slam High lights @ 04:24". Retrieved 11 July 2012. ^ "TFB :: Guy Dupuy dunks (@ 02:00)". Retrieved 11 July 2012. ^ The Official NBA Basketball Encyclopedia,. Villard Books. 1994. p. 49. ISBN 0-679-43293-0. ^ a b c Ostler, Scott (February 12, 1989). "The Leaping Legends of Basketball". Los Angeles Times. ^ "James White 06 NCAA Slam Dunk Contest". Retrieved 1 December 2012. ^ "James White free-throw line between the legs @ 04:50". Retrieved 1 December 2012. ^ "Jamario Moon @ 03:01". Retrieved 1 December 2012. ^ "Dunk Encyclopedia :: Paint Job". Retrieved 31 December 2012. ^ Erčulj, F. (2015). Basketball Shot Types and Shot Success in Different Levels of Competitive Basketball . PLOS One , e0128885. ^ Video, Dunk. "720 Dunk by "The Air Up There"". Notable Dunks. Retrieved 14 September 2011. ^ "Most basketball dunks in a single jump". Retrieved 8 September 2016. ^ Goldaper, Sam (April 30, 1987). "Gus Johnson, Ex-N.B.A. Star with Baltimore, is Dead at 48". The New York Times. ^ Bierman, Fred (February 4, 2007). "In the Distance, the Sound of 'Chocolate Thunder'". The New York Times. ^ "A Roundup Of The Sports Information Of The Week". Sports Illustrated. November 16, 1970. Archived from the original on 6 October 2008. ^ Palmer, Brian (23 March 2012). "Below the Rim: Why are there so few dunks in women's basketball?". Slate Magazine. Retrieved 25 March 2012. ^ "Pioneers Cardte Hicks, Musiette McKinney embrace Las Vegas Aces". Las Vegas Review Journal. Retrieved 2018-04-02. ^ wsj.com, The First Dunk: A Sports Milestone in Women's Basketball. Retrieved 9 October 2009. ^ "Griner Dunks Twice in WBB's 99-18 Win". Baylorbears.com. 2010-01-02. Retrieved 3 April 2010. ^ Brittney Griner dunks twice, Baylor wins by 81 (video). ^ "Page not found - NBC Olympics". Archived from the original on 19 September 2016. Retrieved 8 September 2016. ^ "Archived copy". Archived from the original on 20 May 2012. Retrieved 2012-06-01. CS1 maint: Archived copy as title (link) Article at GirlsHoops.com about the Ladies being denied participation in the '07 Contest. ^ [permanent dead link] Results of 2012 Contest. ^  Review of 2012 Contest. Wikimedia Commons has media related to Slam dunk. Look up slam dunk in Wiktionary, the free dictionary.